Here's the fourth recipe for my Vegan 411 column for HelloGiggles, which you can read in full here. I was initially going to talk about something else in the column, where I wanted to examine the link between traditions and the holidays and what makes everything feel so special. But it felt a bit too personal to share with the whole class, so I though I'd save it for Guac. Now I don't have a sweet tooth at all. I couldn't give a rat's arse about most puddings and would much rather eat two starters than even a bit of ice cream. So desserts and cakes and sweet things do not come naturally to me- they're not something I'll agonise over in the same way I will over achieving a perfect cannelloni. But I realised, as I was thinking about the food I love experiencing with my family and especially when it's cold and we're all back for Christmas, is pudding, and it is because of the small, cherished ceremony of it all. Tradition for me is the moment my Mum (Queen of Puddings) wheels her tea trolley in to the living room as we watch something on the BBC. On the top tray of the trolley is her crumble, fruit compote, almond frangipane tart or chocolate cake. 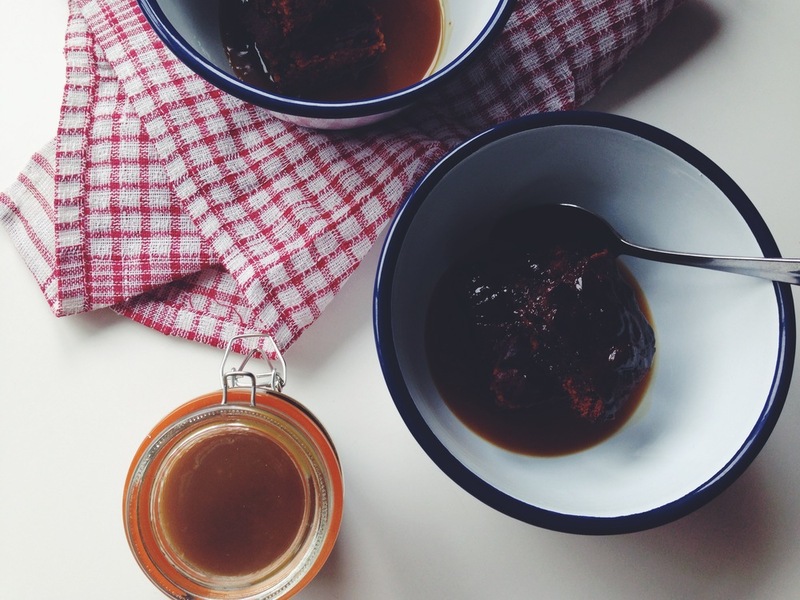 We could be in any house but the strong coffee, bowls of pudding and steaming sauce are what counts. The journey from our kitchen to the living room actually has steps involved so the tea trolley my Mum uses would, in other scenarios, be labelled redundant- but in this one it sort of fits. It's this I think about as I cycle to work 200 miles away in the blistering cold of November in central London, now counting down how many working days I have left until I can board the train for home time. Traditions can be anything, but I think they're the memories that get you home and give you a warm feeling in a freezing flat hundreds of miles away. Preheat oven to 370°F /190°C and line a 7″x7″ (18cm x 18cm) cake tin with baking parchment. Chop up the dates in to chunks and place in a small saucepan. Cover with the almond milk and water and simmer for around five minutes, until the dates are soft. Then take the saucepan off the heat and stir in the baking soda, and leave to cool. In a large mixing bowl, beat together the margarine and sugar until pale and creamy. Add in the date mixture and stir. Next add the spices, and finally sieve in the flour and fold in to the mixture. Pour the sponge mix in to the cake tin and bake in the oven for around 40 minutes, or until the surface of the sponge bounces back when pressed lightly. For the dulche de leche sauce, melt the golden syrup, margarine, sugar and vanilla essence in a small saucepan and simmer for five minutes. Then take off the heat and leave to cool slightly, before stiring in the coconut milk. Serve hot with the pudding, or store in the fridge for a week for leftovers- it’s perfect in porridge, with fruit or just more dessert!